In 1983, I wrote my first quilting book, America’s Pictorial Quilts, on an Atari computer. It was not connected to the Internet because the Internet did not exist, and everything I wrote was saved on a cassette tape that was connected to the computer. It was a tedious process. Because of the lack of an electronic connection to the outside world, I did my research on pictorial quilts the old fashioned way: using a library, pen and spiral notebook. I mailed hand written letters to quilters all over the world. Their names and addresses were, for the most part, gleaned from quilting magazines such as Quilter’s Newsletter, Lady’s Circle Patchwork Quilts, and QUILT Magazine, of which I was a contributing editor. My second book was created in much the same manner, but with the guided research assistance of Cyril Nelson, Editor at E.P. Dutton. 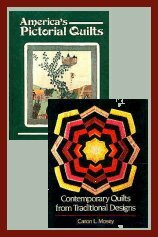 Contemporary Quilts From Traditional Designs was a stab at understanding the strange new direction quilts were taking. In 1987/88, quilters pushed the envelope with quilts that used bold colors, abstract art and fresh new renditions of quilt patterns created by our ancestors several generations back. We were so bold as to dye our own fabrics in buckets in our basements or backyards way back then! I took a long vacation from the quilt world to return to college, work in the public school system and teach at two local universities. I quilted occasionally during that time, but was focused on other things. As the years went by, I found myself longing to pitch the books and the stack of papers needing grades and dive into my (old) stash of fabrics. I bought quilt magazines off the rack and visited quilt shops only to be shocked at what I saw. What had happened to quilts while I was gone?!?! The fabrics changed. The patterns changed. People were (gasp) machine quilting! Not only that, but they invested in machines that cost more than my car! Metallic threads, Angelina fibers, bling, taupe quilts, convergence quilts. the list grew so long it made my head spin. I am slowly adjusting to the change. I use fancy software to help me print photographs on fabric to include in my work. I even bought a machine that will help me quilt faster, and put a Quilter’s Cruise Control on it. I will not, however, invest in a robot to run the machine for me and quilt while I take a shower. Oddly enough, such a beast exists. Technology has planted itself smack dab in the middle of quilting. Instead of traveling around the country visiting and teaching at quilt shows, I sit in my jammies and surf the net. I talk to quilters in Holland, Australia, and South Africa. How cool! As I sat here pondering the subject for my guest post, I kept returning to the same question I sought answers for in 1988: Where are quilts headed in the future, and will they be anything like they were in the past? What defines a quilt today? We have done a lot of growing over the past twenty years. How much more change can we handle? I don’t know about you, but to me the future looks awfully exciting!